Only other thing I noticed is that this person has many other books for sale and nearly all of them are advertised as signed by the author! Seems it would be very difficult to obtain so many signed books. Re: Books On Ebay.....Anne's Signatures? I would agree that these signatures are suspicious. The "A" doesn't quite look right, and overall they lack a certain flair -- they look neatly and precisely signed, with letters vertical rather than a bit slanted in the few signatures I've just checked. I can't imagine Anne not signing in a bit of a rush because she'll have either a big pile or a long line to go, which is likely what gives her signature it's slant and flair. I too think there's something odd with these signatures. They're not quite right and the location is wrong too. Deanne I think you've good reason to be suspect of these signatures. The books she signed for me last June, at her SF Hall of Fame induction, were all signed below her name. If anyone's had her sign any books lately and can tell us if she's started signing above the title, please let us know. Unless the seller can produce pictures of her signing a book above the title I think I'd pass on these. I agree with Cheryl and Becky, and have checked several of my signatures...The A is diffenently wrong..and the loop in the M is not right either. I have over thirty of Anne's signatures in my collection and not once has she signed anywhere other that under her name in one of her published books...only when its been in a magazine or photo does she sign somewhere else...in my opinion and observations. If it was my money I wouldn't buy these books...not with those signatures...to bad someone probably will. Thanks for your input too, Maelin! You've pointed out the exact things I was going to do after checking some of my signed books. It's nice to have as many different opinions as we can getl, especially with signatures. Anne's is VERY distinctive and hasn't changed that much over the years. The signatures I have come from several different (dare I say?) decades. I'm taking the time this weekend and who knows how much longer to photograph my books and signatures, it will be a chore but one I need to do. This way I'll have photographic evidence of the condition of my books, if needed. Sitting here looking at them and the task is seeming to grow larger by the second! Maybe you should drop a line to e-bay to say that there are suspicions about the authenticity of the goods this seller is peddling? despite the fact that Anne has a distinctive autopgraph I have been noticing differences and blamed that to the fact she was getting older. Becky says she didn't notice any differences between older signatures and the once she was able to obtain at the induction in Washington State but I visited Anne after that (in August last year) and I did notice some differences. Furthermore, this seller not only says "signed" but also where and in which shop; so that at least should be traceable and if not true, why make your lie more difficult by mentioning it? The remarks of the place the signature was put in holds true, for my collection, too. My point is that the A of Anne in my collection is always a "double loop", so to speak. The "An" of Anne looks odd; the rest of the signature seems ok to me. I do agree that yes her, signature could change, especially if she's had a mild stroke (heaven forbid!) or something. And no one signs their name exactly the same way every time, but that 'A' is very odd. As I stated earlier I started taking pictures of my books to record not only the signed ones but also the condition of my books, if ever they need replacing. (ugh, what a chore it's turning out to be!) All of the signatures I have are signed below her name, not a one is signed above the title as in these two cases on eBay. And they all look consistantly the same. The seller could just be trying to make them sound legit by stating a place which can be found easily enough thru the internet. As always with eBay or any other internet site where you're purchasing, use caution. "Buyer beware", as the old saying goes. Just don't let it interfere with having FUN hunting for books!!! Good day to each of you. I am the current bidder on both books mentioned in this post. I did not do a thorough examination of the signature when I initially submitted my bids and, just by coincidence, I took a much closer look this morning. That produced in my mind the same questions raised here after I compared the signatures to several authenticated copies I have in my collection. I have since sent a question to the seller asking for provenance. If I am not satisfied with the response, I intend to retract my bids and deal with whatever heat eBay decides to send my way. What was coincidental was my discovery of this thread after I examined the signatures. I was Googleing to see if I could find any other posted Anne signatures that has the same differences noted for these. I will post the outcome. It never ceases to amaze me how fast Google (i.e. their bots) pick up on thread and subject posted on this (and of course) other boards Amazing! Good luck on your inquiry and on further matters if necessary, wpearson. Be sure to keep us informed, please? Uhm, you seemed to have accidentally used your full email address as your user name, too. Do you want me/us to change that for you? I went and had a look at this auction, then looked at some of the other books that were listed. I looked at the signature of one of the Anne Rice auctions and I am not going to say that they are the same, but it put a question in my mind. Jamillia, did I understand you correctly, are you in a position to check the Anne Rice signature and compare what the seller offers to something in your collection? Good luck to you, WPearson, if you do try retracting your bid. This topic may be of use to you for that, either for our specific questions on the signatures, or for showing eBay there's a community of AMC collectors that were already questioning their authenticity. And welcome to our forum! We hope you might stay, now that you found us! Welcome to Jamillia too, whom I think is also new! Feel free to wander into the Welcome thread in the Cafe forum and introduce yourself -- if you want. Welcome to WPearson and Jamilla!!! WP - good luck with your inquiry to the seller of the books. I hope that they can come up with some proof for you or let you retract your bid. As Cheryl said maybe our questioning the authenticity here will help. I found this a while back, and thought that it would come in handy to any of the members that were wondering if an Anne, signature looked real...in a book they were wanting to buy. This is a copy of several of Anne's real signatures perhaps this will help unwary buyers to decide for themselves if the signature they are wanting to buy is real or not. Oh, Maelin! Thank you, I've never seen this site before. How wonderful for new collectors of signatures to have such a sample for comparison. Thanks again! This has me more convinced as to the likeliness that her signature was forged. Even with the variations seen in her signatures on that site, there's a consistancy between them that's lacking on those ebay auctions. Most notably still with the A and the position of the closing of the loop: it's at or after the next upstroke of the pen, not miles before it. On the Killashandra one, the r looks wrong, it's too distinct and well-formed with a straight, narrow top. And on the Moreta one, the loop at the start of the M is clearly purely ornamental for how far around it spirals, whereas it's more of a drag mark for postioning the pen in her real signatures (I recognize what that looks like as I do it on my sigs). The claim with one of the listings is that she signed them at her Encino B&N appearance -- no year listed, but she was indeed there last Aug 2006 for a signing, right before WorldCon, so I assume that's the one meant. The signatures I got from her at WorldCon days later look nothing--NOTHING--like those, but instead match those found on Maelin's link. While I am in no way a trained expert in handwriting analysis or spotting forgeries, this just screams fake to me. Of course, that doesn't mean the seller is the scam artist, unless he's saying he personally got the books signed rather than buying them from someone else. Alrighty, I think the dealer is a ratfink scam artist. Wow, the more of these I look I find to compare, the more convinced I am that he is a forger, and not a very good one at that! What are the chances that one book dealer would have so many questionable-looking signatures in his posession, and not be personally responsible for them? So, what do we do now? I think this guy needs to be looked into by the appropriate authorities (be it eBay or local police or whatever), and that people need to be warned. But I know going around telling people that he is a forger would be a quick way to be slapped with a libel lawsuit. So what's the proper (and safe) course of action? Does eBay have a procedure for something like this? Sellers may not disclaim knowledge of, or responsibility for, the authenticity or legality of the items offered in their listings. Sellers should take steps to satisfy themselves that their items are authentic before listing them on eBay. If you cannot verify the authenticity of an item, do not list it. * "I cannot guarantee the authenticity of this item, so please bid accordingly." Basically, I think this means that if they can't prove the signature is genuine, they ought not advertise the books as signed. And if they disclaim any knowledge of the signatures' veracity, that's also out. I imagine the US site has something similar - I tracked it down in the sellers guidelines section. Last edited by Kath; Mar 22 2007 at 04:50 AM. Reason: Can't type straight today! Thanks, Kath, that's a great help and good info. At least now it's certain that bidder and mom member wpearson can get a refund if there's reasonable doubt. So, when he contact the seller he should be able to annul the deal/bid on the basis that it is much cheaper and more sensible to both that the seller doesn't ship the books to him. No probs! Glad to have been helpful. That is odd that you can't say you can verify authenticity. You'd think they'd want you to do so. Maybe he would have been ok just stating that he bought them at a garage sale and were already signed. Giving us the info of where he bought them. WPearson should be able to back out of his bid without even buying. I've done that before when I didn't read the listing carefully enough and thought I was bidding on an Atlas of Pern but instead it was All the Weyrs. Don't ask me how I got those mixed up! The seller was very nice and I was able to retract my bid. I do hope WP can retract or get out of purchasing with no difficulties. I can understand why they have such a rule, it prevents people from trying to sell known knock-offs without fear of returns/prosecution because "I said I wasn't sure it was authentic -- you still chose to buy it!" Lets hope that this seller is decent enough to let mpearson out of the deal. The seller also might not want any undo attention put on him so that ebay won't get curious and check him out more closely...they would probably close his shop if he is a rip-off-artist..or at least we can hope that they would close him down. So, I went through my collection....and I found a fake!! But really...I should have examined it better when I bought it.... (I was too eager!) ...they spelled "McCaffrey" wrong!! My fault entirely, but now I feel like my collection is tainted!! Fortunately, all of my other books look genuine...I was able to compare them to some bookplates that I got signed by Anne through Gigi!! Now those, I KNOW, are genuine!! That site that Lady M refered....I'll certainly be using that for any futures purchases!! Thankyou Lady M!!! You are so very welcome, I am glad to be able to be of service. You shouldn't feel like your collection is tanted...it could happen to anyone...and nearly has to me twice. When you see a book that you have been looking for for soooooooooo long...and then there it is and it's signed too...well who among us wants to look to hard or long...at that point...we just push the bid buttion and dance around the room for a few minites, until we have finally won our new treasure. Then when it is in the mail and on it's way, that is when we give pause to wonder...is it or isn't it!!! I hope that my link does the trick for anyone in doubt about Anne's signature! This is why I follow a pretty strict rule--if I want an autograph, I only buy from a VERY reputable source (ie, something like a gift catalogue selling signed plates with their books--I have "Lost Moon" with a bookplate signed by Jim Lovell, and I am sure he just signed stacks of the plates) or I get it from the person I want it from. Never, ever, from eBay, used bookstores, convention dealers, or any other source that's hard/impossible to verify. I might take a risk on a low-priced item if I wanted the item anyway, but especially with authors that are dead/hard to come by, I would only buy it if I would have bought it at that price without the signature. 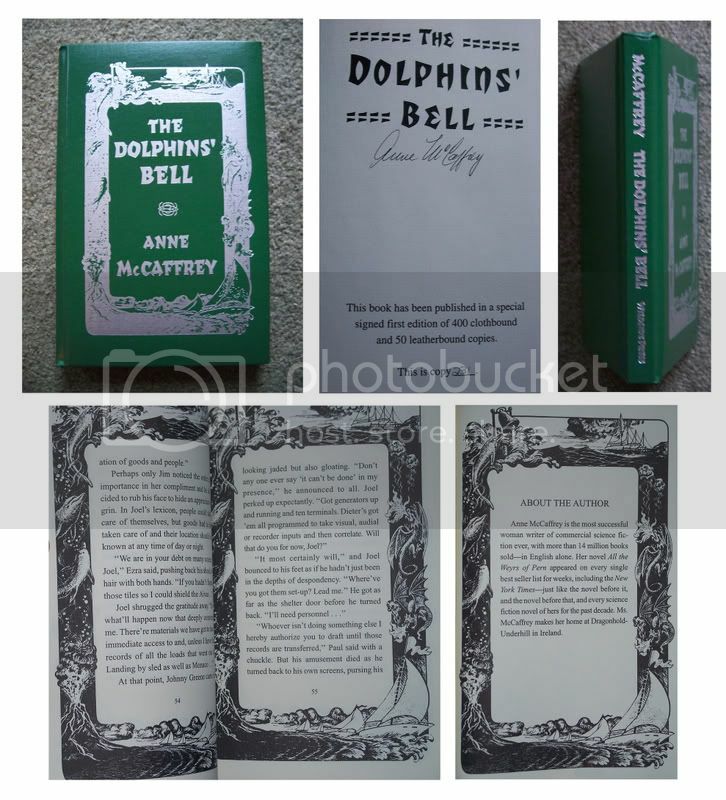 Not that long ago I sold a book on ebay that had an Anne Mccaffrey signature on it I didn't think looked right.......I sold the book at a "regular book" price and stated in the ad that I did NOt believe it was a real autograph. That way I could in good conscience sell the book without someone thinking they were buying a signed copy. I try to only list books as signed if I feel confident that the signature is authentic....such as bookplates obtained from wysiwyg books....we know he deals directly from Anne herself. While MoM menbers would understand that it is hard for other persons to believe you when you tell them you obtained books/bookplates from a person who gets thier stock from Anne herself.......just sounds like a good story that you can't prove! For myself I always ask to see the signature before buying if it isn't already up. That way I can decide if I think the signature is real and if I want to buy it. I don't ever intend to sell my books...at least not the ones with Anne's signatures in them probally not the others either...I just love having them, they are my treasures. I do know that there are several fakes out there...and I always feel sorry for the person that just wants a signed book of Anne's and gets taken to the cleaners by some jerk out to make a few extra dollars at their expence. I have kept it all these years carefully, but the time has come to sell it. I was goint to list it on E-bay and came here, originally, trying to figure out what to ask for it. But then I saw this. Could you all look at this and tell me if you think it's real? I always assumed it was, but well, I guess I'd better check! Last edited by DragonMommy; Apr 5 2007 at 11:55 AM. Reason: duh . . . forgot to sign my name! Charlotte, you have the genuine article there and thus a genuine signature, too. Welcome to MoM, Charlotte DragonMommy! As Hans said, there's no question about that signature being authentic. You have a limited edition book, as stated on the limitation page bound in to the book, and these were signed -- also as stated on that limitation page. Doing a bit of research for you, I can only find one copy of the book for sale thru a used dealer online at present. It's listed at $250, which isn't unreasonable for a leatherbound signed book limited to 50 copies. However I would be surprised if you got this much for it at auction, as that depends on the bidders knowing how rare it is, what they personally feel is a fair value, and what they are willing to spend. I'd start bidding at $50-75 at least, and would think you're not likely to get more than $150 at the most, probably less. I'm interested in it myself, but am currently on a book-buying moratorium. By the way - you got it at Balticon? Any plans to go to Balticon again? I'm thinking of going this year, just on Saturday. Goodness, I had no what to even think about price. Still not quite sure. As for Balticon, I loved it when I went, but until the girls are a little older, I won't have a chance to go back. One day, though!!! Funny coincidence that there's a con called Balt(i)con, held in the Baltic countries (Nordic countries around the Baltic Sea) that will be actually combined with this year's Eurocon in Copenhagen which Anne will be attending (AND some members from here). Welcome, DragonMommy! I'll keep an eye on your auction once you've got it set. Don't have that particular copy in my collection. And I agree with Cheryl's pricing figures. Welcome aboard DragonMommy. Let us know when you put the book up.